In this guide I've attempted to provide an overview of Jungling in SMITE without delving too deeply into the meta of it. As an overview I've attempted to cover the primary aspects of what it involves and how you go about it, while providing a handful of tips that I'd hope you find useful. What is a Junglers role? Jungling is an incredibly important part of SMITE and is fundamental to your team's success. Not only is it fundamental for many Gods that would otherwise struggle to lane (certainly against ranged lane opponents) it’s also key to accessing all lanes. Part of a Junglers role, besides killing camps to secure buffs and experience, is to also “gank” opposing lanes. With three lanes and five Gods, there will also be two solo laners. It’s your role to effectively outnumber the enemy when you arrive on lane: a 2 v 2 becoming a 3 v 2 with your presence or against the solo laner, 2 v 1. This should, if done correctly, allow you to secure kills, experience and gold. In addition to this, you also need to counter-jungle by ensuring the enemy team are starved of buffs and camp experience. Through Ward placement you also need to make sure your team are always aware of enemy positioning. Most Gods can Jungle but some are significantly better at it than others. While Guardians and Mages aren’t particularly great (until late game at least), Assassins are much more capable. Fundamentally, a Jungler has to be able to kill camps quickly and any God that has low base damage won't excel at it. Items such as Bumba’s Mask, Healing Potion and Potion of Physical Might provide the foundation for any Jungler. Bumba’s Mask allows for greater damage versus camps, while the Healing and Might Potion provide some much needed sustain and early damage. Tip - If you can, it’s also worth using and then selling the Potion of Physical Might right at the start. It lasts for 5 minutes and this then allows you to double-stack Mana Potions instead while retaining the buff. Gods such as Arachne are purposefully designed to be effective in Jungle, while other Gods such as Bakasura or Hun Batz excel because of their sustain and/or sheer damage. Almost any Assassin can comfortably Jungle and while some are marginally better than others, they can all do the job. Here are my favorite 5. A lot of players Jungle in different ways, but I’ve often found that a single rotation of the map starting at the first two camps on short lane, followed by moving to the mid lane to help push the wave. Once you have you can move to the camps on either side of the lane or take the starting fire elementals. It’s important that during rotations of the route that you regularly pass back through mid lane and help your duo so that you can keep it pushed and secure some continued gold income. If you can, always drift over to the left side of Jungle (or long lane) to check those camps and to see if you can bully those in it. I must stress that while this route may seem simple and the concept largely is, being an effective Jungler is particularly challenging. Not only do you have to secure camps, experience and gold but it’s also your responsibility to be the eyes and ears in the jungle. It’s your responsibility to punish those who extend too far, Ward where you can and leave buffs ready for your team. The most important part of Jungling as far as I’m concerned is picking up your route once you’ve taken part in a team-fight or if you’ve had to flee while being chased. This, unfortunately, only comes with practice. The route above only covers your half the map and doesn’t begin to dictate the route you should take against the opposing team and their Jungler. Unfortunately, it’s also hard to predict exactly what route they’ll take and when you’ll actually bump into them. What you can assume is that at the start of any match, they’ll do the same as you. From there on in, they’ll attempt to complete the same rotation but it’s important for you to cut off their supply of experience and gold. If you can, you should attempt to disrupt their rotation by being ahead of them - stealing camps when you can. It’s often easier said than done and it’s also high risk. You’re effectively invading the enemy half of the map and if warded, it can lead to your death or at the very least force your team to try to save you. There’s a delicate balance as to when you should invade and when you should stick to your predetermined routine. 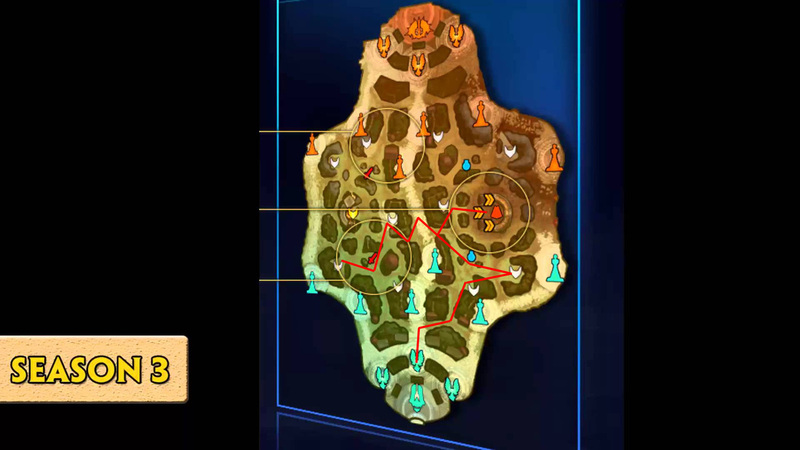 Key to it is having map awareness while feeding off any information your team can give. If you can see the enemy Jungler in the long lane fighting against your own team, you can be sure that there’s very little risk in invading. It’s during these times you should capitalize on stealing their camps as quickly as possible - just be aware that invading is much easier mid or late game than early, simply because of the speed at which you can take camps. Mana (Blue) - Grants 5 mana per second and 10% cooldown reduction for 2 minutes. Damage (Red) - Increases Physical and Magical damage by 20%, +10 Magical Power and +5 Physical Power for 2 minutes. Speed (Yellow) - Increases movement speed by 20% for 2 minutes. Gold Fury (Upon Death) - 300 gold to each member of your team. Fire Giant (Upon Death) +30 MP5 , +30 HP5 , +100 magical power and + 70 physical power for 4 minutes. Each Buff is represented by a color with red detonating damage, blue denoting mana and yellow movement speed. The exception is the Fire Giant who does provide a buff, but it’s gained as a team-wide benefit as opposed to one that’s dropped on the ground. Where the other buffs are concerned, they’re all protected by the buff-holding creature. Defeating the creature will release the buff and allow it to drop to the ground: you, your team or the enemy can then pick it up. A dropped buff will remain for around 30 seconds before despawning and this gives your team time to collect it should they need it. Tip - Just because a minion drops a buff, doesn’t mean you should use it. Ping your team to let them know it’s available so those laning can make use of it. It should be noted that all monsters in camps provide experience and gold when killed and are leashed to their specific location. If you attempt to drag them out of their enclosure, they’ll return to where they were and regain their health. Should you also fail to kill all monsters at a camp, it won’t respawn until you do. As far as “unique” camps are concerned, there are two in the jungle: Gold Fury and Fire Giant. Both are powerful and cannot be defeated easily however, they offer powerful buffs. The Gold Fury provides a large amount of gold and experience while the Fire Giant also provides a large amount of gold and experience, but grants the entire team a powerful buff. Both of these unique camps are mid to late game targets and although high risk, offer high rewards. You should only attempt them when you can be sure they can be secured, otherwise you risk death and then losing either to the enemy team. This list of tips and tricks are just a handful of things we think will help your Jungle play. We'll continue to add to the list as required and if you have any tips you'd like to share, let us know in the comments below and we'll place them here. 1. Sticking to a set route allows you to maximize your gold and experience gain. Although you’ll inevitably stray from it as fights occur or ganking opportunities arise, it’s important to try to get back into the groove. 2. Early game camps and their buffs are useful for you as they’ll allow you to clear camps quickly. Despite that, they can also be invaluable for your solo laner. Ask if they want it before you snap it up. 3. If you’re rotating camps quickly enough you’ll often have time to help push mid or solo lane with your duo. Use this opportunity to bully the lane and secure some gold. 4. It’s fundamental that you obtain Wards. These items provide vision for incoming enemies, allowing your laning Gods to get a heads-up of who’s incoming. 5. Only invade the enemy's camps if you can be sure it’s safe. There’s always going to be an element of risk but if you’re warding and watching the map, you mitigate it. 6. Always look at your map. You should constantly be looking to see what allies and enemies are where in preparation for ganking. 7. On the subject of ganking, it’s imperative that you do and if necessary, buy your time waiting on the wings until the right moment. 8. Securing early ganks can often tilt the enemy team to the point where they make more mistakes - try to get under their skin. 9. If you can disrupt the enemy Jungler by stealing what is likely to be their next camp, do so. This will put them behind and you ahead. Think I've missed something important? Let me know in the comments below, or head to our SMITE Tier List to join the discussion!